Arts Brookfield, the cultural arm of global real estate corporation Brookfield, uses a Martin Audio MLA Compact system to reinforce an eclectic mix of concerts, festivals, symphonies, and other artistic events presented for the community throughout the year in the Winter Garden at Brookfield Place, a majestic 10-story glass vaulted atrium in Lower Manhattan. Originally constructed in 1988, the Winter Garden at the then-known World Financial Center was severely damaged during the September 11th attacks and substantially rebuilt in 2002. It now houses its signature palm tree garden as well as an array of luxury retailers and eateries, and serves as the epicenter of arts and events activity that regularly occurs throughout the Brookfield Place complex. The glass-encased West Wall of the Winter Garden offers incredible views of the waterfront plaza and the North Cove Marina along the Hudson River. A recent event that benefitted from the Martin Audio MLA system was the New York Guitar Festival, a tribute to the “godmother of rock and roll,” Sister Rosetta Tharpe, featuring a house band led by Luther Dickinson and John Medeski with guest artists such as Alvin Youngblood Hart, Valerie June, Dom Flemons, Ruthie Foster, Rachael Davis, and Trixie Whitley. As described by vice president and artistic director of Arts Brookfield, Debra Simon, “It was an incredibly well-attended milestone concert that went late into the night. The typical system for concerts includes eight flown MLA Compact cabinets per side with two DSX subs ground-stacked under the stage and three Merlin controllers. A more compact, streamlined version has also been ground-stacked successfully with four MLA Compact per side on top of the subs when there was flown scenery or other visual elements that necessitated a different approach. 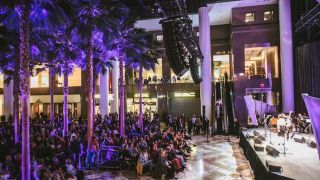 “The Winter Garden is challenging because it’s a huge, reverberant glass dome that traps all of the sounds within it including ambient noise from the retail outlets,” said Mark Torchia, technical director for Arts Brookfield. “We chose MLA because of the control offered by the system that lets us put the sound where it needs to be and avoid areas where we don’t want it. The Winter Garden’s audience space graduates upward. There’s a monumental marble staircase—a popular place for people to sit and watch the performance—so we had to take care of people on the floor as well as those in a more elevated position. “MLA allows us to achieve smooth, consistent coverage from top to bottom, and side to side with no gaps. We needed to achieve articulation and clarity for speech, and it handles that beautifully. The system also works perfectly for music reproduction, especially considering the wide mix of genres performed here. Photo Credit: Images by Ryan Muir, Courtesy of Arts Brookfield.